The new £9.4m leisure centre in Bowbridge Road, Balderton on the outskirts of Newark is now open. This replaces the outdated Grove Leisure Centre which was built in 1968. The 4,260m sq. two-storey building includes a four-court sports hall, a 25-meter, six lane swimming pool and a 20 x 8.5 meter teaching pool, as well as squash courts and an 850 sq. meter fitness suite. 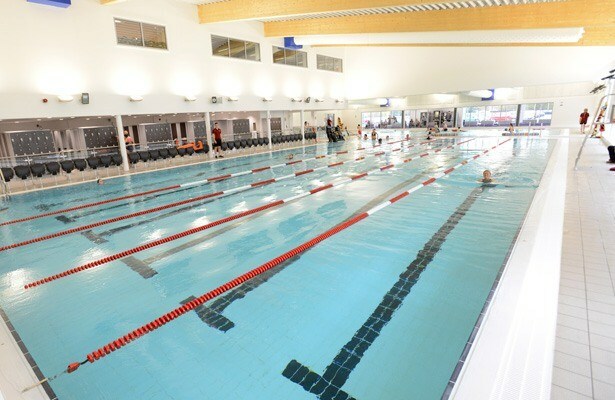 FT Leisure provided the water treatment and filtration systems as well as poolside water features and 2 Poolpod disabled access systems – wheelchair-users and swimmers with disabilities will be able to use the automatic platforms to lower themselves in and out of the pools independently. An innovation on the filtration systems of both swimming pools is the inclusion of automated backwash, which makes the regular maintenance of the sand filters just a simple turn of a switch for the operator rather than manually adjusting valves and pumps.